The key difference between Microsoft Windows and UNIX is that Windows is meant to be easy to learn, while UNIX is meant to compensate for a steep learning curve by providing extraordinary flexibility to knowledgeable users. 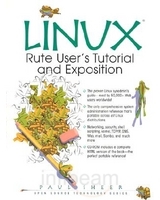 Linux: Rute User's Tutorial and Exposition is the best book on the market in terms of flattening that learning curve. The author, Paul Sheer, uses this book as the text for a class he teaches, and its instructional value is unquestionable. Rather than attempt to make analogies for the way things are done in Windows or in Mac OS, or try to satisfy readers' requirements with mere recipes, Sheer tries to inculcate his readers into the Linux way of thinking. The idea is that work gets done differently in Linux, and you have to get a few concepts clear in order to work effectively in the environment. No matter what kind of Linux systems you're managing, no matter which distributions you use, LINUX: Rute User's Tutorial and Exposition presents the techniques you need to succeed. PAUL SHEER owns Paul Sheer Consulting IT Services, a firm specializing in Linux consulting, programming, and training; Web database integration; cryptography; embedded systems; and related technologies. The electronic version of his LINUX:Rute User's Tutorial and Exposition has become one of the Web's most popular resources for mastering Linux administration. Sheer is based in Cape Town, South Africa.